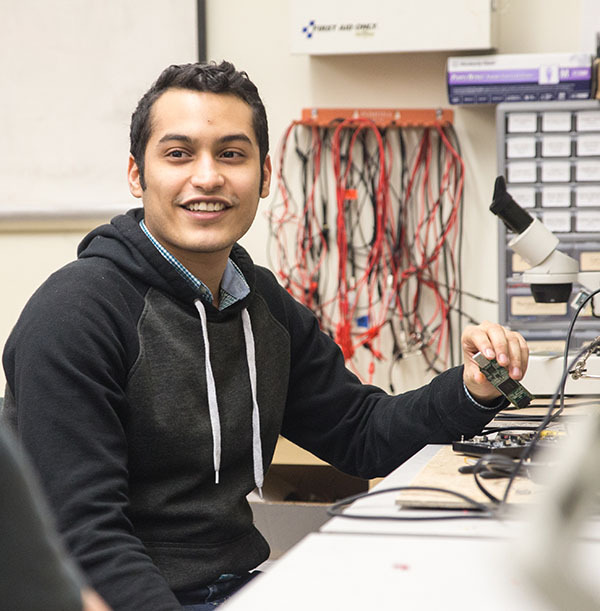 Graduate student Ziad Eldebri was the winner of the Lattice Hackathon Contest hosted by Lattice Semiconductor. He was awarded the grand prize of $5,000 and a trip to the Consumer Electronics Show 2017 in Las Vegas, Nevada. Eldebri competed against other students across the country to create an original idea on how to improve a battery powered device using Lattice FPGA. Eldebri’s winning idea was to develop a LIPO battery charger that could be used in any product that uses Lattice FPGAs. The goal of the competition was to create new ideas on how we can use FPGAs to improve our lives and the electronic devices that we use every day. Yes, freshmen can get an internship. I did! Rey Pocius had a great experience as an intern at Metal Toad as a freshman. As a freshman it’s pretty difficult to land an internship because most companies are looking for people with more experience or students who will be graduating soon. But it is possible! This summer I had the opportunity to work for Metal Toad, a software consulting company in Portland, Oregon that offers technical consulting, product development, application support, and managed cloud services to a broad set of clients such as major TV networks, non-profits, health institutions, cultural institutions (such as The Emmys and Golden Globes), and corporations in the technology sector. I took the initiative to email the marketing manager which eventually led to a phone conversation. I found that professionals in the Portland software community are surprisingly very willing to spend time talking with you. We talked about what the company did and the culture of the company. After some time I was able to speak to the director of human resources and we talked about the internship program, the logistics, and how I could fit into the company as an intern. This led to a phone interview and then a second interview at the company site. The interview was different from what I had expected — it was less technical, and more centered on cultural fit. I then followed up with email thanking them all for their time and saying that I was looking forward to hearing back to them about the position. About a week later they replied to me asking me if I was still available to take the position. It was a learning experience for all of us. 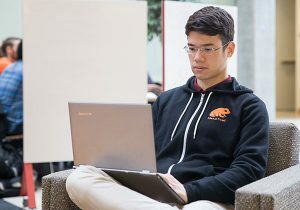 The company is relatively small and their internship program is still growing and changing, so I was their first intern “guinea pig.” I was new to the formal workplace and was doing something completely new to me — DevOps. I took the internship without having seen the office where I’d be working. It was not what I expected. There were no cubicles, but rather it had an open floor plan. Software developers and other professionals sat next to each other. I was to contribute my expertise to the cloud services (or DevOps) team. Our job was to configure custom cloud services to help align with what the software developers are doing and what the clients want. I immediately asked for things to do and I was given task after task by my mentor, who was the senior engineer on the team. It seemed like there was an endless amount of things for me to do if I was willing to learn, so I took on whatever I could, even if I had no knowledge about it. Our team used the Kanban methodology, which produces tickets or tasks from a list of things to do. The Kanban methodology is similar to having a wall covered in sticky “to-do” notes. Members of teams then finished tasks on a first come first serve basis. This methodology worked very well for the small and experienced DevOps team. Everyone on the team was capable of taking on anything coming their way. I took advantage of the resources that I had to learn as much as I could over the 12-week internship. I contributed to several internal DevOps along with working on some client side projects. One experience that students don’t always have access to during undergraduate course work is seeing how a consulting firm, such as Metal Toad, interacts with the clients continuously to create and maintain great products. Being at a small software company allowed me to see all sides of the operations, which was invaluable. Not only was I able to learn and get advice from my mentors, but I was able to learn about the business end of things along with how our work affects our clients and software developers. Being in the city exposed me to other software companies in the area. Our company was part of the Portland Tech Intern Experience which is a collaborative effort to give a voice to Portland’s growing and diverse tech industry. I would highly recommend this organization to gain greater access to players in the Portland tech industry. The program offered several different networking events and lunch learning sessions that helped unite and nurture the Portland tech scene. During these network events, I met and learned from former interns, and was exposed to future technologies areas of computer science such as deep learning. I also met CEOs, angel investors, and recruiters. The networking experience that I gained from this internship is invaluable to me. It really opened my eyes to the special software company culture that Portland has. The CEO of Metal Toad encouraged the interns to message people on LinkedIn who they want to learn more about, and ask them for 30 minutes of their time for coffee, or for anything. Driven interns, even “guinea pigs” who can convince companies they’re able to learn and tackle just about any new task, will find that people are more than willing to help you. Rey Pocius grew up in Elmhurst, IL, where he attended York Community High School. He moved to Oregon in pursuit of the growing tech scene in Portland and the thriving programs at Oregon State. He is also the President of the Oregon State University Association for Computing Machinery student chapter (OSU ACM). He is very passionate about informing others about the ever growing tech field and helping people find the help they need to launch their careers. He is also particularly interested in deep learning and robotics. He hopes to focus his research and efforts into those two areas. Outside of academia he enjoys playing tennis and spending a lot of time hiking around the Corvallis area. So don’t be surprised if you find him on some of the local trails. He also enjoys painting and working on software side projects.